Fleetwood remain seventh in the North Lancs Cumbria League despite losing both matches so far in 2018. 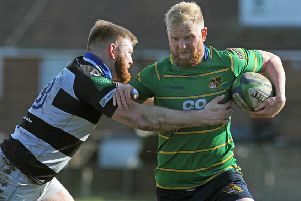 The Green and Golds were looking to complete a double over the Manchester side and started brightly as the returning Ricky Newton, James Lilley and Luke Wilson all made breaks. It was no surprise when the pressure paid off after 10 minutes, when Scott Richardson slotted home a penalty to open the scoring. This spurred Fleet on but the visitors gained the upper hand, particularly in the scrums, though Richardson still managed to double Fleet’s lead with a penalty following a high tackle. However, their opponents were beginning to impose themselves and strip the ball in contact. Most of the rugby was being played in Fleet’s half and they had two let-offs when an Aldwinians penalty was nudged just wide, then the ball was dropped over the try-line. Flankers Jordan Brocklehurst and George Orry came to the fore in Fleet’s phenomenal tackling stint but Aldwinians did slot over a penalty to cut their half-time deficit to 6-3. Handling errors and poor decision-making cost Fleet in the second half as Aldwinians dominated virtually all areas. Only twice did the Green and Golds manage to venture into the opposition half and Aldwinians took the lead with two penalties. Fleet defended heroically but all their attacks had to come from inside their own half as the team from Droylsden pulled level with them in the table. Orry was Fleetwood’s man of the match but head coach Steve Woodburn will need to rally his troops in training ahead of Saturday’s clash with Burnley at Calder Vale.